Yes, I know Goldfinger is a movie. It’s my favorite James Bond film and the first I ever saw. But James Bond was a literary character before he became the super spy we know on film. And I finally had the opportunity to read the novel. I love it as much as I do the film, and this rarely ever happens. The first time I encountered Goldfinger, I was but a peanut. My mom and grandma were watching a movie, and I wandered into the room. Of course, things exploding attracted me to the tv. “Bond, James Bond,” my mother replied. Confused by that introduction, I sat down to watch. Mesmerized, I fell in love with that suave character. As I got older, I watched almost all of the Bond films, and of course debate with people about who is the best actor. Hands down, it’s Sean Connery (Daniel Craig second, Pierce Brosnan third.) But it could be because he was the first Bond I knew. Does what now? It’s a BOOK? I kept telling myself that I would take the time to find the novels and read them, and it was something I kept putting on the backburner. And then I saw this miniseries on BBC America. Ok. That does it. I will read these novels! And naturally, I didn’t get around to it until a couple of days ago. But I am so glad I did. It’s as well paced as the movie, and just as interesting. Bond is a bit more introspective in the novel than he is in the movie, but that is to be expected. I am looking forward to having a Bond marathon this weekend, starting with Goldfinger, and anticipating seeing the movie through new eyes. 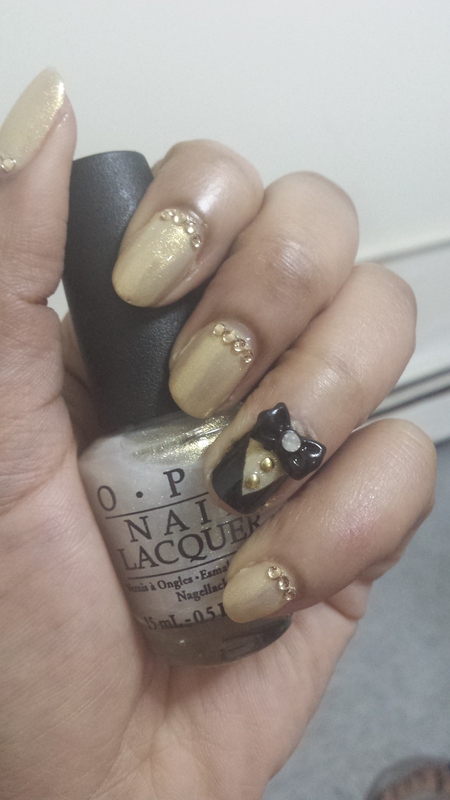 The gold base is a combination of two colors: OPI’s Ski Slope Sweetie (pictured) layered over Julep’s Kennedy. 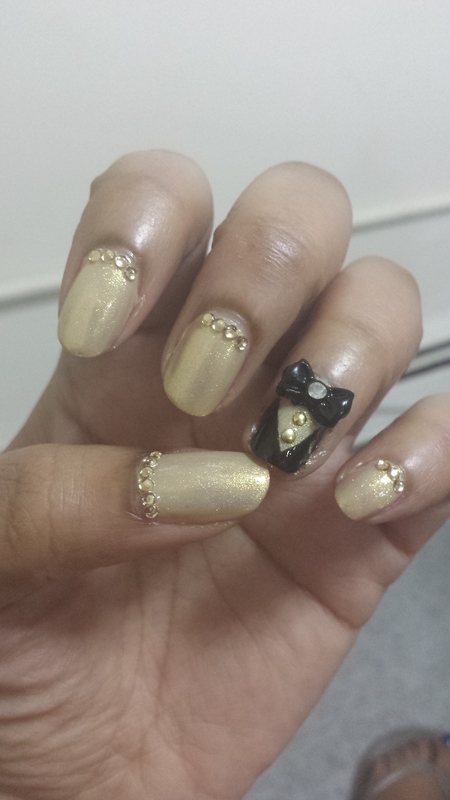 I did some golden rhinestones at the base of my nails, and tuxedoed the ring fingers on each hand with Essie’s Licorice. Right hand has no bowtie, as I would end up knocking it off doing orders at work. Now, I’m off to have martini (shaken, not stirred), and listen to this amazing movie opening. Have a novel you’d love to see in manicure form? Email me! ← What Have You Done For You Lately?